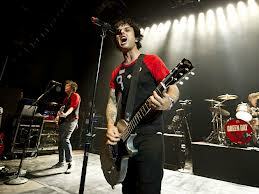 Green Day launched their new album ‘iUno!, iDos!, iTre!’ at a live gig in London’s O2 Shepards Bush Empire on August 23rd. Performing their 1st gig in the UK in nearly 2 years, the awe-inspiring band played 6 tracks from their new album trilogy, inclusive of their newest track single ‘Oh Love’ as well as their Amy Winehouse tribute track ‘Amy’. To begin the show, Green Day’s drummer Tre’ Cool took to the stage on his own and playfully told the audience ‘Sorry everyone, Billie Joe’s (Armstrong) got Laryngitis”. He then played a raggedy version of ‘All By Myself’, which saw Armstrong appear and conclude the song by joining in on the drums. The two band members then swapped to their rightful places in presence of a defining cheer as the band launched into ‘Welcome to Paradise’. Their set lasted two hours and the bank were accompanied by regular live guitarist Jason White as well as two extra musicians. Their performance included well-known tracks such as ‘Nuclear Family’, ‘Stay the Night’, ‘Stop When the Red Light’ and the closing to ’99 Revolutions’. The band’s new album-trilogy ‘¡Uno!, ¡Dos!, ¡Tré!’ will be released in three stages. The 1st album ‘¡Uno!’ on September 24, the 2nd album ‘¡Dos!’ on November 12 and the third ‘¡Tré!’ on January 14. This entry was posted on Thursday, August 23rd, 2012 at 2:40 pm	and is filed under Music News. You can follow any responses to this entry through the RSS 2.0 feed. Both comments and pings are currently closed.